Very few places on the island are this close to the beach! 2 bedroom, 2 bath condo beach retreat located at the Makani A Kai Complex in the quaint harbor village of Maalaea! This complex is one of only two buildings with "full" beach front access. COMPLETE WITH THE SIGHTS AND SOUNDS OF PARADISE! 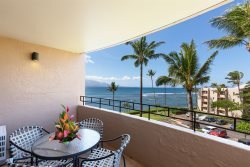 A perfectly located two story DIRECT BEACH FRONT, air-conditioned (split a/c) condo with a peaceful view of the breathtaking Maalaea Bay, the grand volcano Haleakala and the sparkling Kihei lights at night! The complex presents lush and tropical grounds, free parking and a well maintained and clean coin operated laundry villa but...THIS CONDO HAS IT'S "OWN" WASHER/DRYER! A Laid back beach island vibe with romantic architectural features, tall living room windows from floor to the open beam ceiling overlooking the beach! You can sleep in cooling comfort with a/c in both the master and guest bedrooms. Enjoy the spaciousness of a comfy king size bed in each room too. Kitchen is more than well stocked just like a home. Available amenities for use are free Wireless Internet, in living room is a 60 " Smart TV, DVD, cable, in master loft suite there is a 42" with both Cable and Apps, including pre-paid Netflix, in the guest room is a 30" without Cable but with Apps, including pre-paid Netflix, guests can also use the other Apps (Hulu, Amazon etc), but will need their own login, beach chairs, beach umbrella, beach towels and a cooler for your excursions. Visualize sitting on your lanai enjoying a moon lite cocktail or a morning sunrise breakfast! Beach Front, Satellite/Cable, 60" Smart TV, A/C, Ceiling Fans, Split System Air-Conditioning, Wireless Internet, Linens, Towels, Washer/Dryer, Hair Dryer, Kitchen, Lanai, Walkway to Water, Beach Chairs, Beach Towels, Communal Pool,in master loft suite there is a a 42" with both Cable and Apps, including pre-paid Netflix, in the guest room isa 30" without Cable but with Apps, including pre-paid Netflix, guests can also use the other Apps (Hulu, Amazon etc), but will need their own login. Paradise found! Breakfast every morning on a deck just feet from the ocean, surrounded by palm trees and watching sea turtles play in the surf... Truly AMAZING! Spacious, gorgeous and well stocked location, with incredible communication from the rental company! 7 days and 6 nights of a dream vacation! The location will not leave you wanting anything. It was wonderful! We had a wonderful 10 day holiday at this unit. Opened the sliding door to the lanai overnight to listen to the waves breaking on the beach. Turtle watching on the reef right outside the unit & complex. Whales surfacing and breaching just off the beach. Wildlife refuge next door with lots of bird watching - the Black Crowned Night Herons were spectacular! Walking distance to a great aquarium and decent restaurants. Why would we ever want to leave? Idyllic views, comfortable and clean surroundings. We highly recommend this property. A Fabulous First Time (but not last!) Stay In Maui We were completely unfamiliar with the island of Maui and so we weren't sure where to stay. This property was ideal! We were directly on the beach where we took long walks every day or swam in the ocean or in the property's well kept pool. This property is fairly central - no more than a 20 minute drive to everything including Kaanalauli, Lahaina, Wailea, and the start of the "road to Hana". And less than 15 minutes, we were at restaurants, a shopping mall and grocery stores, and the airport. So as for location, it was great. We found there were very few properties with immediate beach access for the price we paid. Each day we checked on the resident sea turtles and one day even saw a whale in the distance which is rare for mid November. When we arrived, we were pleasantly surprised with how clean the unit was and it's layout. As you walk in, there is a beautiful kitchen to the right with stainless appliances and granite counter, all the appliances, glasses, dishes, and cloths you would need. As you enter fully, there is a lovely sitting area with couches and chairs, a small desk, and what appeared to be a 65 inch television. Following that was the balcony (lanai) with patio furniture where we say most nights for dinner and overlooking the ocean. Also on the lower level was a washer/dryer, a lovely bathroom and bedroom with king bed. The staircase led to another full bathroom and a loft bedroom (overlooking the ocean). This layout was ideal for 2 couples sharing. The unit was also equipped with towels, beach chairs, boogie boards, goggles, etc. The staff were great - we received a call from Andreas the day before arrival and he confirmed that everything was ready for us and that he would leave lights on since we were arriving late, and advised on how to reach him should we need anything at all. There was no need, as everything was up to (if not exceeded) our expectations. On the last day, we needed assistance from Amy and she was able to respond promptly and positively to our needs. Mahalo. I would recommend this property to anything who is looking to relax in Maui but who also wants the ability to tour when they want. Bring your Costco membership card and purchase some english muffins/bread/butter and ground coffee (or Nespresso!) for mornings, and pick up some pre-made sandwiches for lunches. We did go out for dinner a few times but used the unit's BBQ for steak and potatoes a few nights. We will definitely stay at this property again. Wonderful! Lanai and view are wonderful and location is great if you have a car. The place was as advertised and was clean and safe. We loved walking on the beach and swimming steps away from our unit! We will very happily return! Andreas welcomed us beautifully and was totally accessible and immediately responsive when I had a question. We were very happy with our stay and felt beautifully taken care of. Thank you, Andreas! Comfortable And In Great Location. This rental is located in Maalaea, removed from the busy congested resort areas but in the center of the island so getting anywhere doesn't take long. There are a few restaurants and shops nearby to supply you basic essentials. The condo is right off the beach. The beach was not congested at all while we were there; it has plenty of sandy areas, but there also a small reef there that you can snorkel and watch the sea turtles. The complex is quiet and well-maintained. Likewise, the condo is well maintained and very comfortable. We had one issue with the condo which they promptly and adequately addressed. Highly recommend! Perfect View and Size We had three people stay in this condo and it was perfect! Nicely decorated and the view is incredible! Beautiful View Of The Ocean! We loved arriving to fresh flowers! The condo was clean and well stocked with our everyday needs. The view was amazing. We loved sleeping to the sound of the ocean and waking up to the view. My kids enjoyed the water toys. Overall we loved our stay and would recommend it. It was perfect for our family. Nice, quiet, peaceful... just what we needed. Maui Memories The condo was in a perfect location on the island! Quiet and peaceful, close to everything. We loved sitting on the lanai and eating every meal while also watching the sea turtles! My husband and son snorkeled off the beach right outside the condo unit and saw many turtles up close! I'm glad this unit is scheduled for central air, as the master bedroom a/c unit was noisy at times. It didn't deter us from enjoying our time there and we would definitely recommend to anyone! Makani A Kai May Stay! We loved the condo and the private, yet central location. The condo is so bright and airy with the 2-story window view out to the ocean. And just a minute walk down to the beach where you can enjoy swimming, snorkeling, and boogie boarding (but watch out for the reef and the shore wave break when the ocean in rough!). The condo is so well equipped with laundry, kitchen gear, comfortable beds, table on deck just a few yards from the crashing waves and nighttime view of lights in Kihei. Lots of gear for the beach: boogie boards, beach towels, kids toys, umbrella, and the most comfortable and easily carryable Tommy Bahama beach chairs. The condo was sparkling clean when we arrived, with beautiful flower blossoms scattered on tables and throughout. We loved Beach #3 in Kihei, the little open air, inexpensive, innovative restaurant Nalu located incongruously in a shopping center, our drive to Hana and beyond completing a full loop, the drive to the wildlife refuge at the end of the road to LaPerouse Bay through miles of black lava rock from the most recent eruption of a lava cone on Haleakala, and of course the drive to Haleakala itself. Thank you for a wonderful home base for these explorations! Amazing View!!! If your looking for Beach Front then this is perfect! We saw sea turtles and whales from the lanai everyday. Being right on the beach was exactly what we were looking for. Had a great stay! Great location, great service, great condo Great location, right on the beach in Malaea, great condo - actually a two levels townhouse. Very organized owner, good communication before and on the day of arrival, making the extra steps to make sure all is fine and to make the guest feel taken care of. Will definitely come again and recommend to friends.